London has an amazing skyline. It’s a complete mash-up between the very old, and the new. Earth had me thinking about, well, Earth. And, of course, my place on Earth. I wanted to explore a more positive concept for this piece, to offset the more pessimistic, frustrated feeling that drove Earth. I settled on landscape, because it is as far as our eyes can see of this Earth. It is our only view of this Earth. Our landscape is our Earth. I’ve been lucky enough to travel many places on this Earth, and I’ve called a few different cities– landscapes – home. I was thinking about Vancouver (my birthplace) compared to London, and how Vancouver is aesthetically such a beautiful city, but London has so much more energy and vibrancy. London’s skyline isn’t as pristine and crystal blue as Vancouver – it’s dirtier, full of brick and stone, but the city is alive and full of so many fantastic pockets that burst with different flavours. 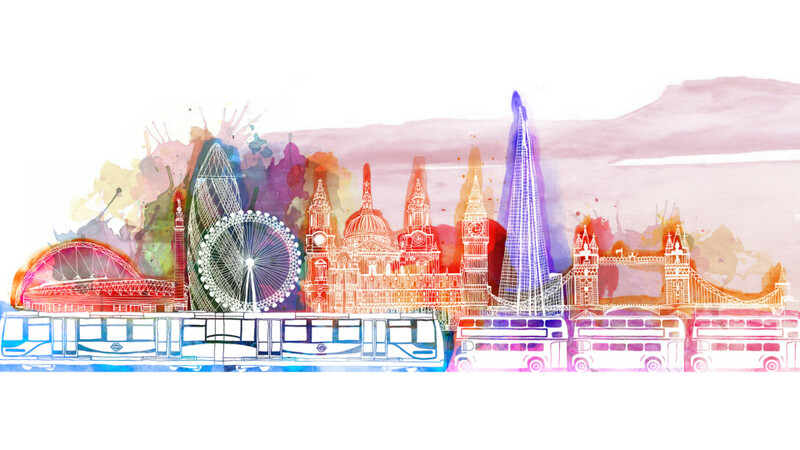 I set about illustrating some of the most iconic buildings in London, and ones that particularly resonate with me. I work near London Bridge, and so I am a frequent explorer around Southbank. The Shard, St. Pauls, Big Ben and the Eye are all on my daily commute. I used to work near the Gherkin, and I frequently cross London Bridge, from where I can see Tower Bridge easily. In South East London (my hood! ), we have the handy DLR train line which connects the East to the South East, which is the specific train I drew. And of course, as anyone who lives south of the river knows, us South Londoners have to rely on the big red busses much more than the Northoners, who have much better connecting trains and tube lines. After drawing all my illustrations by hand, I scanned them into the computer to digitise them. Then, back on paper with brush, I used watercolours to create splashes and smog. Finally, I scanned in the watercolours and overlayed the illustrations, inverted. I’m pretty happy with the final result. I painted it only using half the page, with the idea that Elise could fill in her skyline on the other side. Let’s see where she takes it!